Cities: from Local to Global is a 2nd year undergraduate subject in the University of Melbourne’s Bachelor of Design course. This year, 150 students focused their research on town centres within Wyndham City, one of Australia’s fastest growing local government areas. 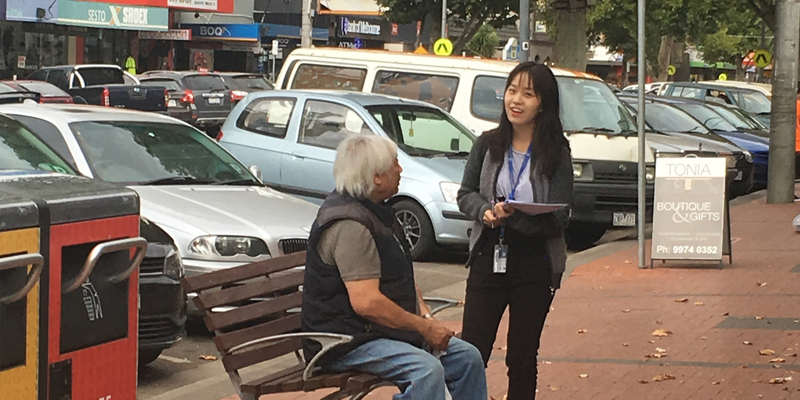 Students undertook fieldwork in the Werribee City Centre, Hopper’s Crossing Town Centre, Point Cook Town Centre and Pacific Werribee. Students were asked to examine several different questions: how does a key issue of ‘access’ and ‘inclusion’ (e.g. gender/age/cultural inclusion or exclusion, walkability, cycle-ability, safety from crime, the ‘activation’ of places) manifest in the site they visited and how is this issue affected by planning choices and decisions? How well did they think urban planning is working to make Wyndham City a better place to live (and for whom)? How can Wyndham City do better? In order to help answer these questions, students conducted accessibility and social inclusion audits and behaviour mapping at their designated site. They also conducted a follow-up street survey, asking members of the public about transport mode choices, reasons for travel to the town centres and the services and facilities they currently access and would like to see added to the town centres. Wyndham City officers provided context presentations to the students as part of their weekly lectures and helped with the survey design and analysis of the students’ data. Wyndham City will use the findings as an input into their strategic planning processes. In the final assignment, students were asked to find ‘one good idea’ from a city other than Melbourne and to create a poster showing how that idea could be applied in Wyndham City to address a specific social inclusion or liveability issue. The best posters have been selected for this exhibition, which will travel to Wyndham City libraries and be presented to Council officers. Launch event: Tuesday 5th June. 6-7pm.